I have both heard that, and said that many many many times. Oh man am I going to enjoy destroying this debate. The misinformed science behind this one was that by stepping on someone’s rope, you would be pushing sand into the rope. The sand then would start to cut away at the rope’s fibers and would eventually cut the rope, because (and this is 100% what people believe) grains of sand are basically tiny knives. Disclaimer: If you are ice climbing and wearing crampons (which are actually knives on your feet), DO NOT step on the rope. That could actually greatly damage the rope and put yourself and your climbing team in danger. Back to rock climbing. Let’s dissect this myth a little bit. 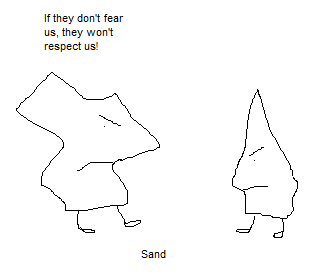 Sand is an abrasive material. This is true. If you were to take some very coarse sand paper and rub the same part of a rope over and over again, you could indeed cut the rope, eventually. It makes sense why this myth seems reasonable. However, stepping on a rope is not enough to cause any kind of real damage. Think about the force that you exert when you casually walk on level ground. Now think about the force that’s exerted on a rope when you take a fall (whether leading or top roping). Now picture the countless times that your rope has touched the rock in multiple places during those falls. Ever fallen or rested on a slab? Think about all the countless touch points for your rope against the rock. Climbed on sandstone? You know the largest component of that is sand, right? If all it took to introduce a dangerous amount of sand and dirt into our ropes was simply stepping on them, places like the Red River Gorge would be death traps. You’d need a new rope after ever climb, or at least check your rope before every climb to make sure it was still safe to climb on. What you should know about ropes is how to assess their safety and to know what are the signs and symptoms of a rope that needs to be retired or starting to undergo damage. If it were true that stepping on someone’s rope suddenly brought upon the potential of the rope being unsafe, how would a single beer properly compensate that person for destroying their $200 rope? And shouldn’t we be retiring and replacing ropes then after every stomp? Why would you climb on a rope that you know is potentially unsafe due to trample, or let others climb on those ropes? Beer or no beer, the rope is either safe to climb on or it isn’t. If you argue that by stepping on a rope, you’re introducing abrasion which will contribute to the faster wear and tear of the rope, leading to a shorter overall life span than would have been the case if the rope was never stepped on, I might be inclined to agree with you. I would then start demanding that we start taxing beers whenever someone didn’t properly extend their draws and caused the rope to unnecessarily touch the rock, and another beer for slab climbs. A third beer every time the rope went through a crack system, and another if a climber chose a climb that had them going over a roof. Ropes are exceptionally tough tools to which we trust our lives. It takes a heck of a lot more than stepping on a rope to introduce material that will eventually make it unsafe. Many guides (myself included) will stomp on their ropes in order to keep them organized when belaying from ledges. These are the professionals who are certified, are charged with keeping you safe, and who you trust to teach you how to climb safely. We don’t stomp on ropes out of laziness, but rather because it is not an unsafe practice.